Mmmm. Definitely all quiet on the North Eastern front. What about all you chaps who said you could post something now you've moved house/done the ironing/walked the dog (delete as appropriate)? Anyhow. I've been mainly busy with the American N Scale; getting James doing some scenic work etc. As I've no current 2mm layout, I installed a 2mm test track at the front of the N layout. It seemed a good idea to scenicise this somewhat, delineate it from the N Scale and give a backdrop for any photos I might want to take. 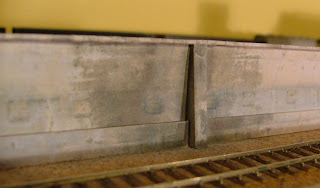 I'd been playing with the Scalescene printed papers on the American layout with some success and now I've adapted the concrete retaining wall for use with the 2mm track. The results are reasonable and it was nice to work with printed paper and card again. I'm interested as to the durability of inkjet printed papers; we'll see how these stand up. Tony the retaining wall looks good in the photo. Have you weathered it or is it straight from the box? I've been trying the Scalescene papers for Marks Quay. Only the sky is permanent so far, but I think they look good, better than the Peco ones I started with! The papers have been lightly dusted with light grey weathering powder and then sprayed with acrylic varnish. I thought I'd overdone the varnish at one point at the paper got too wet and buckled, but seems okay once dried. Varnishing is a must as otherwise the water soluble inkjet print may run/blotch.